This project focuses on the design, implementation and evaluatation an embedded smart camera targeted for various surveillance applications such as traffic control. A smart camera combines video sensing, video processing and communication within a single device. Thus, smart cameras not only capture images or video sequences, they further perform high-level video processing and compression on-board and transmit the (compressed) video data as well as the extracted video information via a network. The targeted traffic surveillance applications require high-quality images as sensor input and extraordinary on-board computing performance. 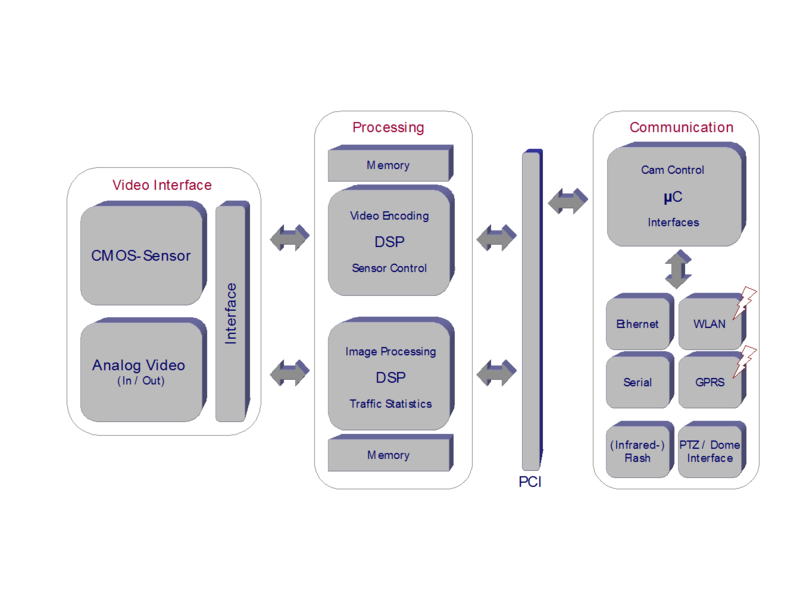 The system architecture of the embedded smart camera is shown in the figure below. It is realized using a CMOS image sensor, high-performance digital signal processors (DSP) and dedicated hardware subject to several constraints such as low-power consumption, real-time operation and fault tolerance. The scientific challenges in this research projects are focused on the specification, modeling, design, implementation, configuration and evaluation of a "Smart” distributed embedded system. From our perspective this includes (i) the combination of complex and intelligent algorithms with real-time capabilities, (ii) the system-level specification of hard- and software for an embedded system with high flexibility, (iii) the efficient implementation of high-level algorithms, e.g., in MATLAB, onto target platforms for embedded system, (iv) fault tolerance mechanisms to support autonomous operation, and (v) low-power design and dynamic power management. The major challenge we are facing is to address the above issues in the highly distributed setting of a network of many smart cameras, where each of which is a heterogeneous multiprocessor system. This research project is joint work with the Austrian Research Centers Seibersdorf (ARCS) and the Institute for Computer Graphics and Vision (ICG) at the Graz University of Technology. It is further supported by Texas Instruments.